I was just posting about this on Facebook, so I thought I’d drop a note about it here too. 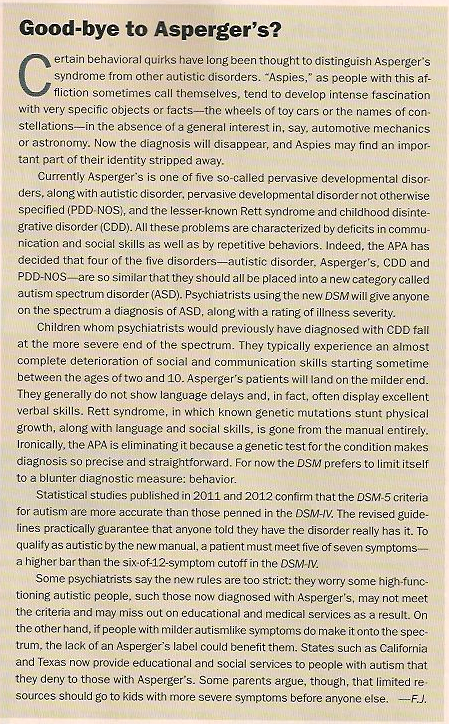 According to Scientific American Mind, May/June 2012, one of the changes that is coming to the DSM-5 (aside from dropping the roman numerals) is that they will be getting rid of the category of Asperger’s. Instead, people with this disorder will be labeled on a spectrum disorder with levels of severity noted. I’m including the short article here, so you can read more about it. It was kind of surprising to me to hear about this. I know that there are a lot of people with Asperger’s who have parts of their identity wrapped up in the diagnostic criteria. It would be like them getting rid of schizophrenia I guess. Suddenly some part of your identity is renamed. It is kinda strange. I don’t know if it is good or bad. That is part of the tricky thing about mental disorders and labels…most people with a mental disorder usually wind up having some part of their identity tied to a label. For good or bad or whatever…it just seems to happen.